Adding to the ECB's gloomy outlook, the Bundesbank lowered German growth projections, warning of downside risks: the German central bank today revelaed its updated growth projections, which cut back the GDP forecast to just 1.5% this year from 2.0% expected previously, hardly a surprise after the -0.2% q/q contraction in Q3. The forecast for 2019 was cut to 1.6% from 1.9% and for 2020 and 2021 the Bundesbank expects rowth of 1.6% and 1.5% respectively. "The data this morning out of France really hasn’t helped the mood. 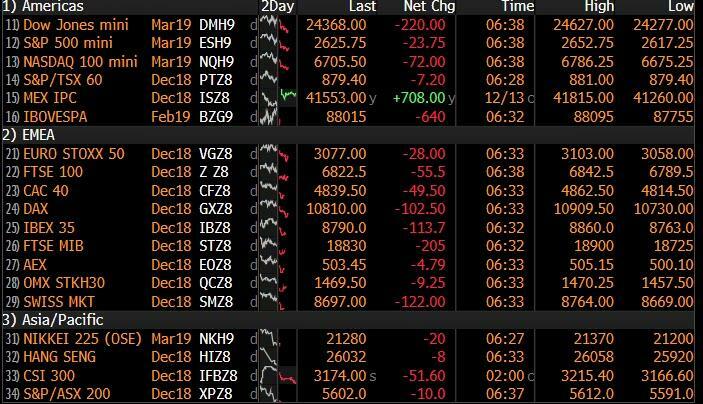 You look at China data, you look at the flash PMIs out of France and Germany and they’ve really sort of reinforced concerns that the global economy is slowing down," said CMC Markets chief markets analyst Michael Hewson. "Ultimately, I think it rather questions the wisdom of the ECB ending its asset purchase program at the end of this month. You’ve got Mario Draghi basically tightening into a downturn." Over in the US, S&P 500 futures also pointed to a drop at the open, though both declines were tempered somewhat on news that China will temporarily remove a retaliatory duty on U.S.-imported automobiles. In the currency market, the euro was down 0.7 percent after the weak PMIs, last changing hands at $1.1288. The Bloomberg Dollar Spot Index headed for its best week in four months, rising to 1,215 and just shy of 2018 highs. Antipodean currencies led losses in the Group-of-10 basket. Sterling’s rally fizzled as signs that the British parliament was headed towards a deadlock over Brexit prompted traders to take profits from its gains made after Prime Minister Theresa May had survived a no-confidence vote. Oil prices gave up some of their Thursday’s gains following inventory declines in the United States and expectations that the global oil market could have a deficit sooner than they had previously thought. U.S. crude futures edged down 0.5% to $52.32 per barrel and Brent crude slipped 0.6 percent to $61.09, after both gained more than 2.5 percent on Thursday. Gold (-0.3%) is set for is biggest weekly fall in five weeks due to a firmer USD as traders focus on next week’s tabled Fed rate hike. Looking at base metals, copper is on track for a third consecutive weekly drop with downside exacerbated by the downbeat Chinese industrial production translating into weaker demand as the red metal faces a 15% yearly decline. Asian equity markets were negative across the board as sentiment in the region soured following the lacklustre lead from Wall St and as region digested disappointing data from China. ASX 200 (-1.1%) and Nikkei 225 (-2.0%) both declined from the open with Australia led lower by tech, telecoms and the largest weighted financials sector, while the Japanese benchmark was subdued amid a firmer JPY and mixed Tankan data despite the headline Large Manufacturers Index and Large All Industry Capex topping estimates. Elsewhere, Hang Seng (-1.6%) and Shanghai Comp. (-1.5%) were also pressured after Chinese Industrial Production and Retail Sales data both fell short of estimates, with underperformance seen in Hong Kong as this year’s run of lacklustre stock market debuts continued in the domestic exchange. Finally, 10yr JGBs were higher as they tracked gains in T-notes and with prices underpinned by safe-haven demand which saw 10yr JGBs print the highest since November 2016. European equities are poised to finish the week on the backfoot (Eurostoxx 50 -0.9%) following the weak lead from Asia as sentiment turned sour amid the release of disappointing Chinese industrial production and retail sales, highlighting weakness in the Chinese economy. As such, around 75% of the Stoxx 600 (-0.9%) are in the red, Switzerland’s SMI (-1.4%) marginally lags peers with all 20 stocks in negative territory. In terms of sectors, IT names underperform alongside auto names (seen as trade proxies due to heavy exports) as a result of the aforementioned Chinese retail sales signalling an impact from ongoing trade disputes. 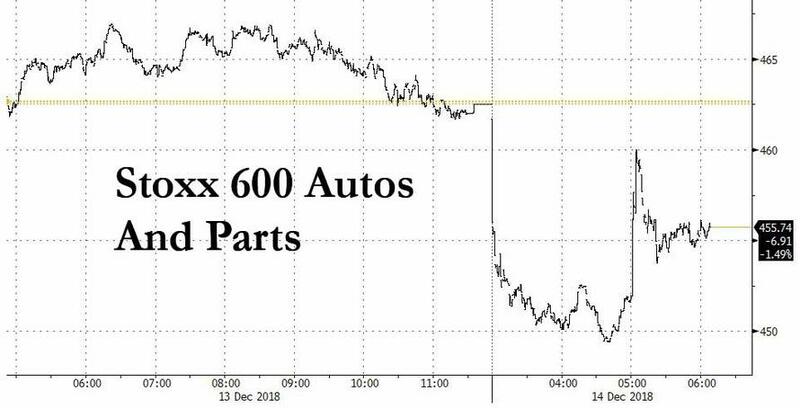 However, European auto names spiked higher following reports that China are to lift retaliatory tariffs on US autos for 3-months from January 1st next year (i.e. suspending the 40% tariff plan and sticking to 15%). In terms of individual movers GVC Holdings (+8.8%) shares rose to the top of the UK benchmark with Citi citing next week’s Parliament vote on FOBT stakes being “significantly positive” as shareholders will be paid out GBP 676mln if the legislation is not passed by 28th March 2019. In currencies, The Antipodean Dollars have derived some scant support from reports that China will freeze and backtrack on a proposed increase in US auto tariffs w/e January 1 next year, in line with recent speculation, but the Aussie and Kiwi remain on the backfoot and significantly weaker than their G10 counterparts following sub-forecast Chinese data overnight and RBNZ consultations about lifting high grade bank capital requirements by 100%. Aud/Usd is holding just off a fresh December low around 0.7155 after breaching 0.7200 and tech supports below the figure at 0.7186 (55 DMA) and 0.7163 (Fib), while Nzd/Usd has lost grip of 0.6800 as the Aud/Nzd cross pivots 1.0550. EUR/GBP: Also major underperformers, as the single currency extended post-ECB losses on the back of further declines in EZ PMIs (French readings especially dire as manufacturing, services and composite all tumbled into sub-50 contractionary territory) and through recent support just ahead of 1.1300 vs the Greenback to 1.1286 before finding some bids. Note, a decent 1 bn option expiry at the 1.1300 strike may provide some traction. Meanwhile, Brexit remains the big bane for Sterling and given the ongoing impasse between UK PM May and EU leaders on the back-stop, Cable has retreated sharply towards 1.2570 and chart-wise back below the 10 DMA circa 1.2660. JPY: As usual, demand for the safe-haven Yen is just keeping Usd/Jpy depressed within a tight 113.70-40 range, along with 1.4 bn expiries at 113.75. EM: An unexpected, though far from total surprise ¼ point CBR rate hike has underpinned the Rub against the grain of overall regional currency weakness on risk-off flows, with the Rouble comfortably above 66.5000 vs the Usd. In commodities, WTI (-0.7%) and Brent (-0.9%) swings between gains and losses following an uneventful overnight session as prices consolidated after yesterday’s rally. The complex saw some upside in recent trade after Libya’s NOC chairman was pessimistic about reopening its 300k BPD El-Sharara after an armed group halted production at the oilfield. Traders will be eyeing this evening’s Baker Hughes rig count as fresh catalyst. Note, WTI Jan’19 options expire today at 19.30GMT. Elsewhere, gold (-0.3%) is set for is biggest weekly fall in five weeks due to a firmer USD as traders focus on next week’s tabled Fed rate hike. Looking at base metals, copper is on track for a third consecutive weekly drop with downside exacerbated by the downbeat Chinese industrial production translating into weaker demand as the red metal faces a 15% yearly decline. Finally, Shanghai steel extended gains for a third day in a row after two major steelmaking cities (Tangshan and Xuzhou) demanded mills to curtail production amid worries that they will not meet pollution reduction targets this year. For context, Tangshan accounts for 10% of China’s total steel output while Xuzhou is in the number two steelmaking province. Looking at the day ahead, in the US there should be plenty of focus on the November retail sales report where expectations is for a +0.4% mom ex auto and gas print and +0.5% mom control group reading. A reminder that the latter is a direct input into the GDP accounts. Also due out across the pond is the November industrial production print (+0.3% mom expected) and October business inventories. Meanwhile we’re due to get comments from the ECB’s Guindos and Lautenschlaeger this morning before Angeloni speaks this afternoon. With just ten business days left in 2019 now, after the Brexit shenanigans earlier this week markets were always hoping that the ECB would be a less eventful affair. Indeed, luckily there was no sign of a scrooge surprise from Mario Draghi in what proved to be a fairly non-eventful policy meeting yesterday. As expected we got confirmation that net asset purchases were to cease by the end of the year while the dovish tightening that we expected was affirmed with an endorsement of the short end rally and a hint that a replacement for TLTRO2 is in the pipeline. In line with the views of our economists (link here ), the reinvestment programme retains a lot of flexibility over the purchases. There was no twist of the portfolio, and the ECB’s preference was for a revision to the guidance on the period of full reinvestment, implying this could last longer. “Continuing confidence with increasing caution” was Draghi’s new mantra our colleagues highlight. That said there was one surprise and that was the suggestion that the ECB is starting to rethink the structural impact of negative deposit rates on the banking system. This increases the possibility of a technical deposit rate hike – a hike for non-cyclical/non-monetary policy purposes – in 2019. Draghi said the reductions to the staff GDP growth forecasts take the economy on a path “closer to potential”. This could be an admission that the window to raise rates to address structural bank profitability is getting narrower. So where does that leave us? In their 2019 outlook our economists delayed the timing of lift-off of the policy rate tightening cycle from September 2019 to March 2020 given the deteriorating expectations for growth and inflation. However they also mentioned the risk of a technical, one-off deposit hike and the team believe that March 2019 is perhaps the best time for the technical hike now.This is arguably when the replacement for TLTRO2 will be due. It is also six months before the current time commitment to unchanged policy rates expires, meaning March is the appropriate time to consider an extension of the commitment if they are right about the outlook for the economy. Something to consider then. The market also seemingly viewed the meeting as a bit of a non-event. The euro initially declined and hit as low as -0.33% versus the dollar intraday but ended up closing -0.07%. The STOXX 600 flipped between gains and losses with no real conviction and eventually closed a shade in the red with a -0.17% decline. Meanwhile, 10y Bund yields did nudge to an intraday low of 0.254% at one stage but also reversed into the close to finish at 0.281% and +0.5bps on the day. A remarkable statistic about Bund yields is that they are currently lower than they were when QE started in March 2015, when Draghi supersized QE and cut the depo rate in March 2016, and when Draghi outlined plans to end QE this December and set guidance for a rate hike at the June meeting earlier this year. Also keep in mind that the ECB’s balance sheet has increased by €2.5tn since QE started. In that time it has cost the ECB about €119bn for each one-tenth of a percent to get the year-on-year headline CPI number to where it is now although Eurozone CPI hasn’t risen by that different an amount to US CPI over the same period. More startling is the fact that it has cost the ECB €625bn for each tenth of a percent increase in core CPI which has been in a fairly narrow range over the whole period. The gap between Eurozone and US core CPI has also stayed pretty constant. In addition, while Bund yields have in essence moved sideways, 10y BTP yields are 171bps higher and eurozone banks have lost €152bn in market cap. We will never know the counterfactual but there’s been a huge financial cost to the program but with inconclusive evidence about its success. As for Wall Street yesterday, well there wasn’t really much to write home about however once again we saw a fairly familiar story with a solid open quickly giving way to a more lacklustre finish in the afternoon. Indeed the S&P 500, DOW and NASDAQ ended -0.02%, +0.29% and -0.39%, respectively, while US HY cash spreads also closed little changed. Treasuries were +0.4bps higher in yield at the 10y point while the 2s10s curve steepened +1.2bps. More exciting was WTI oil climbing off the day’s lows to end +2.80% following the reports about Saudi Arabia slashing supply on shipments to the US. To be fair there wasn’t a great deal of newsflow outside of the ECB so maybe headline fatigue played a bit of a factor. There wasn’t much of a reaction to the news that China had detained a second citizen from Canada while advisors to President Trump warned the President to stay out of the Huawei case according to the WSJ. That being said, overnight sentiment in Asia has turned decidedly more negative following a slew of soft data in China. The the Nikkei (-1.83%), Hang Seng (-1.55%), Shanghai Comp (-0.68%) and Kospi (-1.35%) all down along with S&P 500 futures (-0.69%). 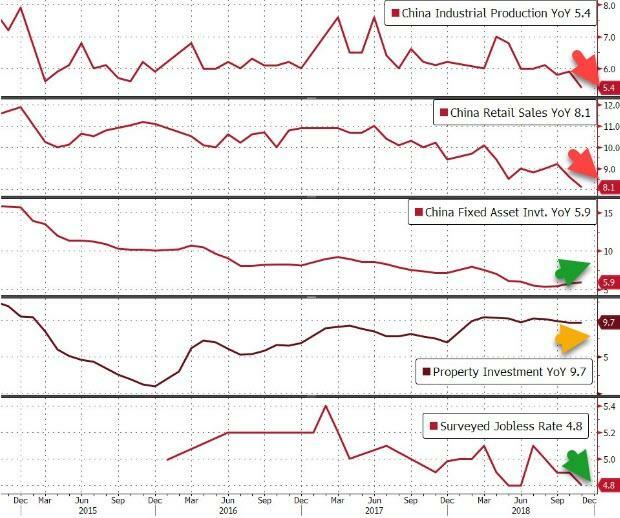 China’s November retail sales came at +8.1% yoy (vs. +8.8% yoy expected) while November industrial production stood at +5.4% yoy (vs. +5.9% yoy expected). There was better news for YtD November fixed assets ex. rural which came at +5.9% yoy (vs. +5.8% yoy expected) however the focus has been on the former two big misses with retail sales actually now growing at the slowest rate since 2003. You’d have to assume that this data would up the stimulus talk again and interestingly, it comes after PBoC Governor Yi Gang said yesterday that monetary policy will remain supportive in the face of China’s economy faltering. In other news Japan’s preliminary December manufacturing PMI came in at 52.4 (vs. 52.2 in last month) while this morning the BoJ trimmed purchases of 5-10yr (JPY 430bn today vs. JPY 450bn in previous operation) at a regular operation today for the first time since June. JGBs are actually slightly stronger despite that. Moving on. With the ECB out the way we can now turn over to the flash December PMIs which are out in both Europe and the US today. With the Italian budget situation stabilising and the ECB keeping to the script for the most part yesterday, will today’s PMIs in Europe help cement a festive cheer into year-end for European risk assets? The good news is that expectations are now fairly low following three consecutive monthly declines in the Euro Area composite to 52.7 in November. As a result the consensus is for a very modest 0.1pt increase to 52.8 with no real deviation from the manufacturing (51.8) or services (53.4) prints expected. In terms of timing we’ll get the data for Germany and France just after 8am GMT this morning followed by the broader Euro Area prints at 9am GMT. In other news, with UK PM May boarding a plane for Brussels yesterday there wasn’t a great deal of Brexit newsflow to follow the confidence vote. 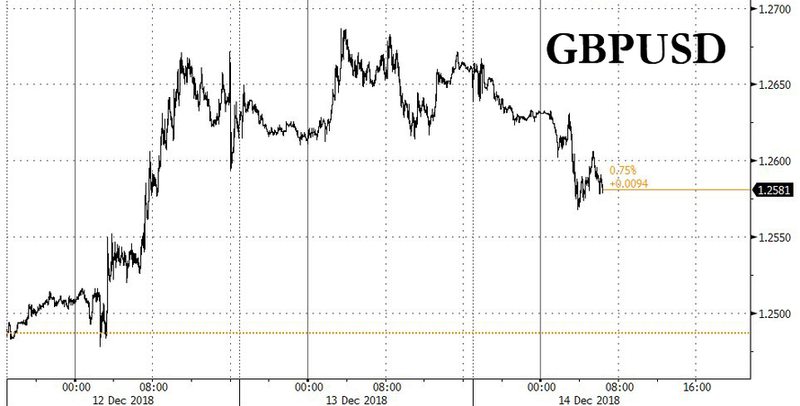 There were some headlines on Bloomberg suggesting that EU leaders were mulling publishing a new declaration on the Irish backstop issue which helped Sterling (+0.11%) to climb slightly but it’s hard to know how substantial this was. DB’s Oliver Harvey, in a report published yesterday, noted that although there was no clear direction from the PM about her Brexit strategy in her statement on Tuesday night, reports have suggested that the UK government is now seeking legally binding commitments from the EU27 over the Temporary Customs Arrangement in the Withdrawal Agreement. In Oliver’s view, the prospect of substantively changing the existing Withdrawal Agreement is limited, other than by replacing a whole UK backstop with a Northern Ireland specific one. As May has ruled out any Brexit deal that does not gain the support of the DUP, the latter seems unlikely. In summary, should the UK stance continue to centre on iterations of the current agreement, it is unlikely to pass a parliamentary vote late this year or, more likely, in January with the UK government now committed to a vote by January 21st. On the basis of May surviving the confidence vote, Oli’s view was that May would pivot towards a cross party approach to Brexit, in particular softening the stance on the future relationship to gain Labour Party support however this thesis is now about to be tested. So it should be an interesting and long few week ahead. Before we look at the day ahead, quickly wrapping up the data that was out yesterday. In Europe there were no revision changes in the final November CPI prints for Germany (+0.1% mom/+2.2% yoy) and France (-0.2% mom /+2.2% yoy). Across the pond there was a bit of focus going into the latest weekly claims print but in the end it fell back towards the record lows at 206k (vs. 227k expected). Assuming it’s not a one-off, that suggests then that the noise around Thanksgiving and also perhaps the Hurricanes in the US were the reason for the move higher. Meanwhile, we also learned that import prices fell 1.6% mom in November, largely reflecting a drop in energy prices, lowering annual inflation to just 0.7% yoy from 3.3% yoy previously, while a federal budget deficit of USD204.9bn was recorded in November – USD66.4bn larger than in the same month last year and rising the 12-month running deficit to USD883bn. As for the day ahead,the aforementioned PMIs out in Europe and the US will almost certainly be the main data highlight. 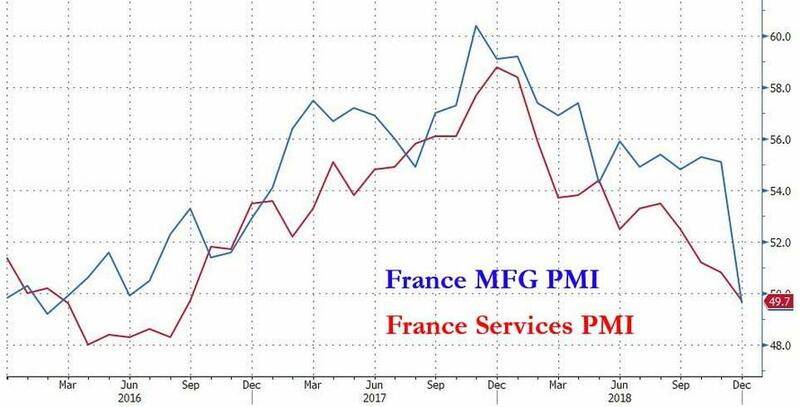 Away from that in Europe we also get the November wholesale price index for Germany, November new car registrations for the EU, Italy’s final November CPI revisions and QE labour costs data for the Euro Area. This afternoon in the US there should be plenty of focus on the November retail sales report where expectations is for a +0.4% mom ex auto and gas print and +0.5% mom control group reading. A reminder that the latter is a direct input into the GDP accounts. Also due out across the pond is the November industrial production print (+0.3% mom expected) and October business inventories. Meanwhile we’re due to get comments from the ECB’s Guindos and Lautenschlaeger this morning before Angeloni speaks this afternoon.